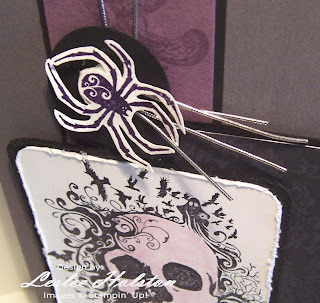 Leslee's Creative Inspiration: Plum Scary!! The card is anyway. The sketch is awesome! I used Mercy's Tuesday Sketch Challenge #32 (MTSC32) which you can find on her blog, Lord Have Mercy. Just click HERE! Mercy has brought back her weekly sketches and she's started them off with a bang! I knew exactly what stamps I wanted to use...my new From the Crypt set. I've paired it with the awesome new Cast-A-Spell Designer Series paper. I'm loving these two new items. Graphically speaking, they pair will with the Extreme Elements set. I'll show you more of that this week too. This card is pretty straightforward. I'll spare you the 'gory' details and won't point out the obvious. 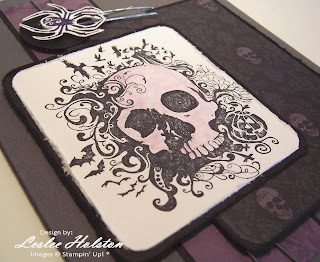 I will tell you that I used Jet Black StazOn ink on the skull. 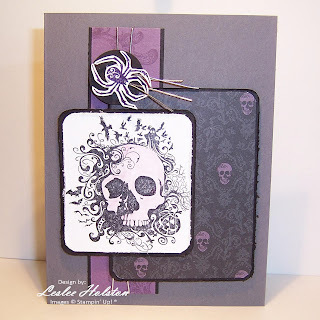 I used my blender pen to color in the skull with Pale Plum craft ink. If I would have used the craft or classic Basic Black, the ink would have smeared...of course, it might have made this card even scarier...hmmm. The panel of Perfect Plum was stamped using VersaMarker on just a corner of the stamp with the bat in the center. I left any sentiment off of this card, but there is plenty of room to add one (once I decide what I want to put on it). Thanks for stopping by today! I certainly enjoy sharing with you. I hope you are inspired to check out Mercy's blog and challenges. She has been a huge source of inspiration to me.